As standard with virtually all gyms & large multi-purpose rooms, excessive noise, reverberation & speech intelligibility are all common noise control problems. The problem occurs in these scenarios due to multiple factors. 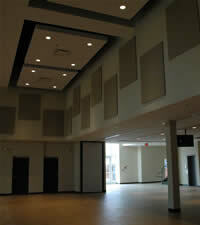 Intelligibility is the ability to use speech to communicate effectively in everyday situations. All Noise Control was presented with these concerns from Shawn Walden w/S&L productions in Cairo, Georgia. He needed to provide soundproofing for Thomasville United Church’s gym and stage area to make this space a more comfortable and usable area. 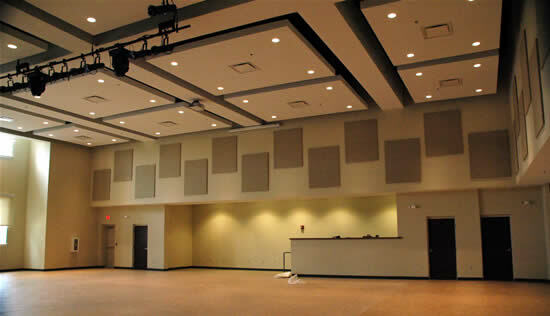 Soundproofing a multi-purpose auditorium style area seems daunting however All Noise Control with their soundproofing and noise control expertise guided Thomasville United Church to a peaceful, fairly simple installation solution using Noise Control Panels. ANC-3000 Noise Control Panels are fabric wrapped wall panels that come in a huge variety of colors to match or improve aesthetics. At the core, they have a honeycomb type shape to help dissipate the energy from the noise as well as making them durable and rigid to withstand heavier use. The fabric wrapped around them acts as an absorbent that softens and absorbs some of the noise roundings and leveling out the reflective noise that is bouncing around from multiple directions. With proper placement, these Noise Control Wall Panels soak up the noise at each reflection quickly bringing the noise to a controlled level. Specific to this application, the 3000 High-Density Wall panels were the product suggested and purchased by them. The results are always the easiest part of an installation. After receiving and installing the wall panels. S&L productions and Thomasville United Methodist Church were completely satisfied with the 3000 High-Density Wall Panels and would highly recommend All Noise Control and their ANC-3000 High-Density Noise Control Wall Panels. We invite you to call All Noise Control at 561-964-9360 to discuss the noise control materials supplied to this particular church and are just as happy to listen to your individual needs and supply you with a customized All Noise Control Solution. You may also visit the ANC-3000 used in this particular church for more information at www.allnoisecontrol.com.